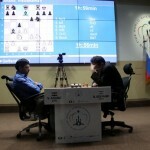 Future generations are unlikely to marvel at the draw in the penultimate game of the 2012 World Championship match, but if they come across Sergey Shipov’s live commentary they’d at least grasp the psychological drama. 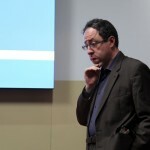 The World Champion’s opening surprise plunged Boris Gelfand into a 35-minute think that had his supporters worrying he’d cracked under the pressure. When Shipov remarked in his introduction to Game 8 that there might be “negative side-effects” for Boris Gelfand after his win the day before it was hard to imagine things would go quite so spectacularly wrong. Instead of consolidating his lead he almost forced Viswanathan Anand to win perhaps the quickest miniature in World Championship match history. While commentating on Game 2 of the Aronian-Kramnik match Shipov wrote: “I’m at home in Moscow in the company of 2 cats and 3 computers. I consult them constantly when studying a position, but I don’t trust any of them”. Evgeny Potemkin’s videos filmed during Game 2 of the World Championship match reveal those weren’t empty words. 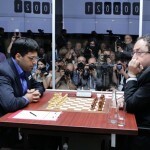 World-renowned commentator Sergey Shipov is providing live commentary on the World Championship match in Moscow between Viswanathan Anand and Boris Gelfand. The Russian originals at Crestbook will be translated into English here at Chess in Translation, and by Dana Mackenzie at his blog. World Cup Semis, Day 2: Svidler!